Diving In Belize "Our Belize Vacation" - "Our Belize Vacation"
Belize has the second largest barrier reef in the world, second only to Australia. Which means, Belize can provide incredible diving and snorkeling experiences on your next vacation in Belize. There are over 50 dive sites available from most any dock in San Pedro, on Ambergris Caye (island) in Belize. There is also three of the five Atolls located in the Western Hemisphere, right off the mainland coast of Belize, and don't forget about the world renown diving site, "The Blue Hole", made famous by Jacques Coutsteau in 1972. Ambergris Caye and Caye Caulker are the most popular tourist destinations in the Northern Belize Caye Diving Sites. Our dive operator has access to over 50 diving sites right from their dock and they make several excursions to the Blue Hole (Lighthouse Atoll) and Turneffe Atoll each week. The Lighthouse Atoll is about (2) two hours by boat from our dive operators dock (more or less depending on sea conditions) and the Turneffe Islands are about (1) one hour by boat, from our dive operators dock (more or less depending on sea conditions). These boat rides can be arduous if the weather turns rough. NORTHERN CAYE - TOP DIVE SITES: Mexico Rocks, Statue, Tres Cocos, Tackle Box Canyons, Mermaids Lair, Esmeralda, Boca Ciega, Cypress Tunnels, Pillar Coral, Hol Chan Cut, Shark-Ray Alley, Amigo's Wreck, Coral Canyons, Stingray Village, Caye Chapel Reef. Right in the heart of Belize, lies the small coastal town of Dangriga, about 40 miles south of Belize City. Most visitors arrive here by plane, but it is possible to drive or take a bus either from Belize City along the unpaved Manatee Highway or from Belmopan via the Hummingbird Highway, for a better road and quicker journey. If you are seeking a mixture of activities, the mainland resorts and hotels in Dangriga, Hopkins and the Sittee River can arrange day trips to sites such as the Tobacco and South Water Cayes and the offshore Atolls. From Dangriga, you can also arrange inland excursions to the Cockscomb Basin Wildlife Sanctuary and several Mayan ruins. If diving is the primary focus of your trip, Dangriga is the departure point for Tobacco Caye, South Water Caye and Glover's Reef. Just 10 miles southeast of Dangriga, is a tiny 5 acre island called Tobacco Caye, here pirates and buccaneers used to hideout. Puritans then settled on the island in the mid-1660's, naming it in honor of the first tobacco crop they planted. Thus today, this small island is known as Tobacco Caye. MIDDLE CAYE - TOP DIVE SITES: Faegon's Point, Faegon's Bluff, Cuda Point (Cuba Scuda), Fishy Point, Turtle's Rest, Tobacco Cut, Tobacco Channel, Eagle Ray Bowl, Jack Fish City, Coral Monument Canyon. Most Southern Caye dive sites are accessible from Placencia, which is about a 40 minutes flying time from Belize City. This small tropical coast side town, sits on the south end of a narrow 15-mile peninsula that parallels the coastline and is the country's southernmost diving hub. Development here is fairly low-key and the narrow "main street" is accommodates a small number of hotels, guesthouses, bars and resorts, which boast of the best beaches in Belize. Like Dangriga, Placencia is an ideal base for both divers and those seeking other diversions. Inland attractions include Cockscomb Basin Wildlife Sanctuary, the Monkey River and several Mayan ruins. The coastline south of Placencia sweeps west and diverges from the barrier reef, this results in a much broader reef table than than what you'll see in the north. Large expanses of coral reef are laced with channels that drop between 90 and 110 feet, then rise abruptly beside the many shoals and Cayes. From Placencia, the diving sites take a bit longer to reach. South of Gladden Spit the reef topography is a mixture of reef flats and spur-and-groove formations, both ending atop sheer walls. Here divers may encounter whale sharks, mantas, in this region, mainly in the Spring and early Summer. SOUTHERN CAYE - TOP DIVE SITES: Mosquito Caye South, Laughing Bird Caye North, Laughing Bird Caye, Laughing Bird Caye South, North Wall, Silk Cayes (Queen Cayes), Silk Cayes Canyons, Pompion Caye Wall, Pompion Caye, Chub Canyon. 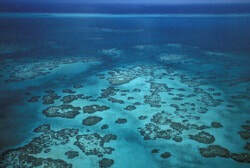 2nd LARGEST BARRIER REEF IN THE WORLD! The Caribbean boasts many attractions for visiting divers, but only Belize offers the unique topography of the world's second-longest barrier reef and three of the Western Hemisphere's four coral atolls. 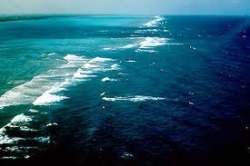 The waters off this tiny Central American country also contain more than 450 scattered Cayes, or small islands. Combined with the Barrier Reef and the three Atolls, these features promise an amazing variety of diving, snorkeling and water activities. Here you will find some of the most spectacular walls around, not to mention the impressive Blue Hole, a collapsed under water cavern made famous during Jaques Cousteau's in his 1970 expedition to Belize. Diving is the driving force behind most of Belize's tourism industry. You'll find a range of dive resorts and dive centers to suit almost any pocketbook or personal diving preference. Day boats and excursions to the reefs allow multiple diving opportunity two or three times a day, while live-aboards allow more experienced divers the opportunity to visit some of the outlying Cayes and offshore Atolls. Whatever your experience level maybe, you will find a treasure box full of fascinating and wonderful dive sites to chose from. Anything from wall dives with stalactites, swim-through caves and Atoll lagoons that shelter a dazzling selection of corals, sponges, fish, invertebrates and marine mammals. Snorkelers can indulge their curiosity in the calm shallow waters trapped within the reefs and lagoons. While Belize consistently ranks among the top three Caribbean dive destinations, the diving industry here has not developed at the same furious pace as at other locations, so it's still possible to find uncrowded reefs and enjoy a less commercialized setting ashore. Most dive sites lie along the barrier reef and offshore Cayes and Atolls and are accessed by boat, with a handful of shore dives off Tobacco Caye, South Water Caye and the atolls. This website highlights some of the most popular sites. Keep in mind that there are countless others, including those that have yet to be named or even discovered. Underwater, many regions will share topographical similarities. Generally speaking, shallow coral gardens, sandy plains and turtle grass beds lead to complex spur-and-grove formations, which plunge over sheer walls to depth. But you will find, that each region is distinctly different with subtle changes in coral growth and marine life. Most of the dive sites along Ambergris Caye are ideal fore repetitive diving, as many of the walls start in only 20 to 50 feet and are topped by shallow sandy area with flourishing coral formations. Most dive centers offer two-tank trips in the morning and afternoon, while live-aboards schedule as many as five dives a day if you have the energy. The dive sites described in this website are divided into four categories: (1) Northern, (2) Middle, (3) Southern, (4) Offshore Atolls. 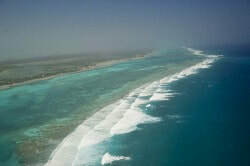 Southern sites in the Northern Cayes are accessed from Belize City, Ambergris Caye or Caye Caulker. Site located in the Middle Cayes, are mainly accessed from Dangriga on the Belize mainland. Sites located in the Southern Cayes are mainly accessed from Placencia. The three offshore atolls are presented as a separate region, though they can be reached from a number of locations. You can choose an extended day trip from one of the main departure points and/or islands. To really experience Atoll diving sites extensively, we recommend the live-aborad boats, which generally concentrate their diving on the Atoll areas. For the purposes of our diving and vacation packages, our tour operators visit the Lighthouse Atoll and the Turneffe Atoll only. While visiting Belize, you can try a dive to see if the sport appeals to you, enroll in a certification course or further your diving skills. Most dive centers offer courses ranging from basic Open Water through Divemaster, as well as speciality courses such as nitrox diving, deep diving, night diving, etc. One option for student divers is the referral program, in which you do the classroom work at a dive center close to home, then complete your open-water dives with a dive center in Belize. 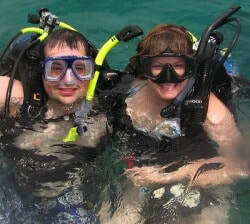 Both live-aboard boats operating in Belize also offer a wide range of diving courses. 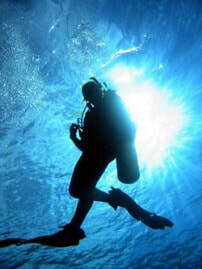 * An instructor or divemaster should accompany a novice diver on all dives. Regardless of your skill level, you should be in good physical condition and know your limitations. If you are uncertain of your own level of expertise for a particular site, ask the advice of a local dive instructor. He or she is best qualified to access your abilities based on the site's prevailing dive conditions. Ultimately, however, you must decide if you are capable of making a particular dive, a decision that should take into account your level of training, recent experience and physical condition, as well as the conditions at the site. Remember that conditions can change at any time, even during a dive. Most Belize operators are in touch with the Divers Alert Network, an association of medical doctors based at Duke University, P.O. Box 3823, Duke University Medical Center, Durham, NC 27710. The number for emergency medical referral is 919-684-8111. 2. Tell your guide unusual conditions. 3. Inquire about unusual conditions. 4. Never dive if you don't feel alert and well. 5. Never drink and dive. 6. Never dive where you can't easily get out. 7. Never dive while on medication, unless you first consult with a doctor. 8. Never feed fish while diving, you could attract sharks and barracudas. 9. Never dive beyond your physical capabilities. 10. Avoid diving if you have asthma, diabetes, or are subject to seizures. 11. Dive with a partner you can trust; your life depends on your buddy. 12. Do not touch coral or unfamiliar sea plants or fish. You could suffer painful injury. 13. If confused or unsure, get out of the water. 14. Inspect your diving equipment carefully. 15. If unsure of your dive master, ask Black Orchid for assistance. Sub-aquatics operates the only recompression facility in Belize, adjacent to the airport on Ambergris Caye. Local dive operators fund the chamber and support staff. You may be asked to donate $1.00 per tank dived as a contribution to their efforts. For minor illnesses contact a doctor or visit the Karl Heusner Memorial Hospital in Belize City. For more serious complaints consider air evacuation to Houston, Miami or New Orleans.